Customer Defaults has been enhanced to support MiFID II-related fields. Click the Show Compliance Columns checkbox in Customer Defaults to display the MiFID II columns. The box is checked by default. For MiFID II, client short codes are configurable in Customer Defaults, so you can configure rules for which ones get applied per user, exchange, product, etc. Registered IDs/Short Codes are stored in X_TRADER and applied to each submitted order. Risk administrators can create Customer Defaults for X_TRADER users in TT User Setup and configure them so that end users cannot override their values. 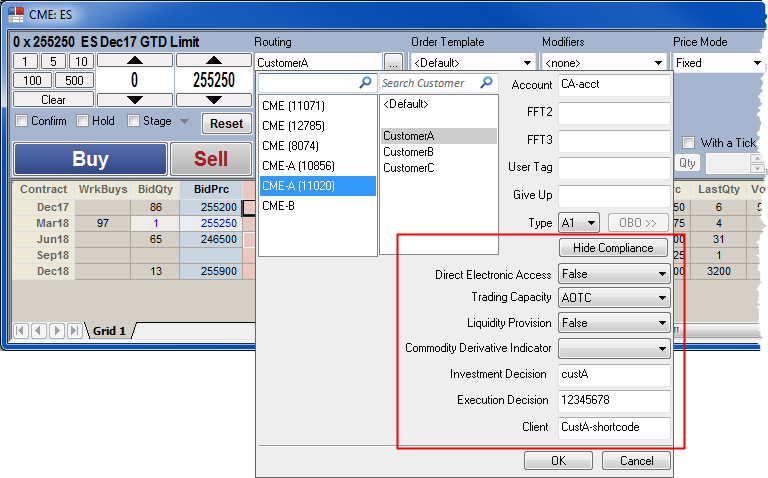 In the following example, the customer defaults are configured with the short code (e.g., 12345678) of an individual trader, who is also same trader making the investment and execution decisions. The next example shows a broker with separate customer accounts in the Customer Defaults window. The registered LEI short codes are different for each customer and are shown in the Client column. The Execution Decision field shows the broker's registered ID and will be the same for each order. After Customer Defaults have been updated with the applicable MIFID II values, you can click the Show Compliance button in the Routing Configuration Dialog Box to view the MIFID II fields for each customer. When the MiFID II fields are shown in the Routing Configuration Dialog Box, the button displays Hide Compliance. If not restricted by your risk administrator, you can modify the MiFID II values for the current order action. Any modifications made in this view only apply to the current order action and do not change the Customer Default entry. After the orders are submitted, the MiFID II fields are sent with each order and appear in the MiFID II columns shown in the Audit Trail. The MiFID II fields are also sent to the exchange for Change, Cancel/Replace, and Delete order actions. If customers are changed on a working order, the MiIFD II fields on the order are also changed. For example, if "CustomerA" submits a 10 lot order, but the order is changed to "CustomerB" and deleted in the Order Book, then the MiFID II fields in Customer Defaults for "CustomerB" are sent to the exchange on the delete action and displayed in the Audit Trail. In addition, MiFID II tags are changed on an order if two or more users share an Order Book and one of the users initiates a Change, Cancel/Replace, or Delete. In this case, the MiFID II tags of the user initiating the change are applied to the order and submitted to the exchange. For example, if "User 1" submits a 10 lot order and "User 2" highlights the order in the Orders and Fills Window and modifies or cancels the order, the MIFID II tags are updated with "User 2's" selected customer. If no customer is selected in the Customer dropdown, the MIFID II tags of the best match <Default> customer are applied to the change or cancel. Descriptions of the MiFID II fields in the Customer Defaults window are shown in the following table. Required settings vary by exchange. When setting these fields, refer to MiFID II Order Fields by Exchange. Indication of who made the trading decision. Enter a registered ID/Short Code. Indication of who or what algo submitted the order. Enter a registered ID/Short Code. Identification of the customer (LEI/Short Code). Free text.